Pernod Ricard premium rum brand Havana Club has launched the Havana Club Tributo Collection. This new series of limited editions created with exceptional rum reserves will be unveiled annually at the Cuban Habanos Festival. With only 2,500 bottles of each rum being released, the Havana Club Tributo Collection is expected to appeal to spirits connoisseurs and collectors. As a tribute to the best that Cuban rum has to offer, Havana Club Maestro Ronero, Asbel Morales, will select the finest aged bases from cellar reserves to cr eate each release. The 2016 limited edition is led by a base of rums aged in 80-year old casks, which has been blended with other rums to give an aromatic and intense taste with defining notes of dried tropical fruits and a deep amber colour. The packaging presents distinctive luxury blue and gold cues that enhance on-shelf standout. The signature of Maestro Ronero Asbel Morales and the individual number of each bottle is displayed on the detailed premium label. 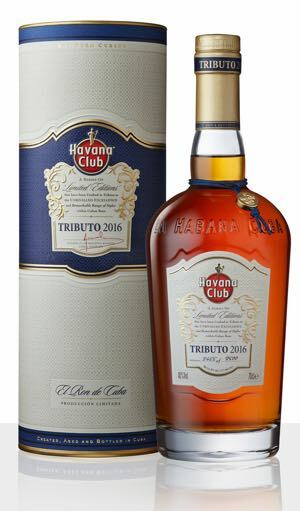 The Havana Club Tributo Collection 2016 is bottled at 40% ABV and will be available in 10 markets, including Cuba, UK and China, from March 2016 at the RRP of US$350.